Injured by Xarelto blood thinner in New York? The Dr Shezad Malik Law Firm has filed mass tort personal injury and product liability lawsuits against the manufacturers of the new blood thinner Xarelto (rivaroxaban) for folks who suffered serious bleeding events. Bleeding is a known side effect associated with anticoagulants, and Xarelto is more dangerous than older blood thinners according to some experts, because no antidote exists to reverse its blood-thinning effects. In the event of a bleeding emergency, patients may be at risk for irreversible bleeding problems, including life-threatening brain and gastrointestinal hemorrhaging. Are you looking for a Xarelto Brain Bleed or Gastro-Intestinal Bleeding Attorney in New York? The Dr Shezad Malik Law Firm is currently investigating and accepting Xarelto uncontrollable bleeding injury cases nationwide, including California, Florida, Illinois, New York and Texas. 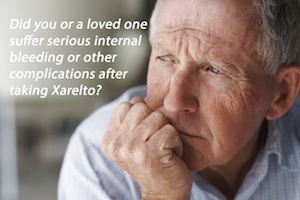 If you or somebody you know has been injured or died as a result of Xarelto bleeding, you should contact the Xarelto Injury Team attorneys at the Dr Shezad Malik Law Firm immediately for a free case consultation. Please use the contact form to contact us or call toll free 24 hours a day at (888) 210-9693 ext 2. In these Xarelto bleeding injury lawsuits, patients are seeking compensation from Bayer and Johnson and Johnson's subsidiary Janssen for past and future medical bills, lost wages, pain and suffering and, in cases of death, funeral expenses. Also, they are seeking punitive damages, which are awarded to punish the defendant for its bad acts of selling a potentially dangerous drug without an antidote. Bayer and Johnson & Johnson’s Janssen Pharmaceuticals, Inc. are exposed to over 2,200 Xarelto lawsuits claiming that Xarelto is dangerous and defective. According to the Xarelto victims, older anticoagulants (e.g. warfarin, Coumadin) their blood-thinning effects can be reversed using vitamin K, but there is no antidote available for Xarelto. Because of this lack of antidote, doctors have no sure fire treatment for Xarelto bleeding in an emergency. Plaintiffs in the lawsuits claim serious and fatal injuries, including cerebral (brain) hemorrhaging and gastrointestinal bleeds, from use of Xarelto. The manufacturers of Xarelto pushed Xarelto as a superior anticoagulant despite studies finding higher rates of gastrointestinal bleeding and transfusions in Xarelto users. The manufacturers of Xarelto continue to market Xarelto as a safe anticoagulant option. Doctors are not trained in methods to stabilize and treat a Xarelto patient in the event of a serious bleeding complication. Xarelto patients are not adequately warned of the health risks of suffering a fatal bleeding event. Xarelto is linked to serious bleeding complications, excessive blood loss, intracranial hemorrhaging, eye bleeding, stomach bleeding, and gastrointestinal bleeding. Lawsuits against Bayer and Johnson & Johnson are consolidated in two courts, a multidistrict litigation court in the Eastern District of Louisiana and a mass tort litigation court in Philadelphia. The MDL in Louisiana contains over 2,200 federal lawsuits, and the mass tort in Philadelphia contains more than 400 state lawsuits. Judge Fallon set a series of four bellwether trials to go before juries in the Spring of 2017. The first two trials will be held in the Eastern District of Louisiana, on February 6 and March 13, 2017. The third trial will be held in Mississippi on April 24, 2017 and the fourth trial will be held in Texas on May 30, 2017. The cases that will go before juries on these dates will be pulled from a pool of 40 lawsuits to be selected in January 2016. If you or a loved one suffered serious bleeding problems while taking Xarelto, the attorneys at Dr Shezad Malik Law Firm would like to hear from you. The statute of limitations prevents claims not brought within the short time period of the injury, contact us today for a free consultation on your possible options. We will review your case and tell you whether you qualify for possible compensation.